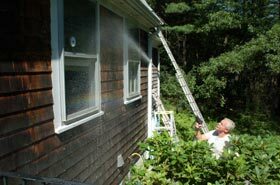 Careful powerwashing will remove mold, mildew, algae, dirt and some loose paint safely and completely from all exterior surfaces of your property. Algae is the green material that is a precursor to moss. Paint cannot adhere well to any of those, which can cause new paint coats to fail quickly. Powerwashing is often an important and necessary first step in preparing your surfaces for painting. Powerwashing also helps to protect unpainted surfaces from being damaged over time. 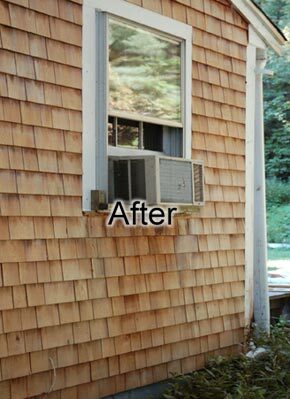 If you don't remove mold and mildew, it will eat through paint, wood trim and shingles, even the baked enamel finish on aluminum siding. Repairing this damage can be costly and time consuming. I have the expertise to powerwash your property with care, to clean it to like-new condition, without damaging the surfaces. This is an important distinction, as inexperienced powerwashers may unwittingly cause damage. 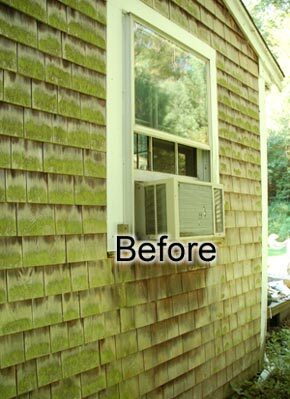 Powerwashing is an excellent, quick and afforable way to make your property look beautiful again. It can help you to make a good first impression when you show your property to prospective buyers, and can increase your property's value by 5-10 percent. I painted a Cape style house with natural cedar claps in the front and natural shingles on the rest. It was black with mildew on the Northern side. The porch on the front had been marked up by an inexperienced power washer. After three days of power washing, it looked new again. The owner was so happy with the cedar, she opted to have it coated with an exterior gloss clear. That was one of the most attractive finishes I've ever applied. 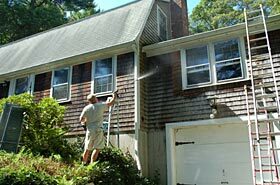 How often you have your home or property powerwashed depends on a number of factors. Feel free to contact me for a free consultation and a no obligation estimate on your next powerwashing job.